Most are well-acquainted with additive manufacturing (AM) — as a rapid prototyping tool, at least. And while many companies believe and perpetuate the myth that AM is only a prototyping tool, innovators in a range of markets (e.g., aerospace, healthcare, consumer goods and more) are already using AM for production-grade manufacturing when design, performance and cost factors align. Identify if there’s a strong business case for switching to AM for your part or product. 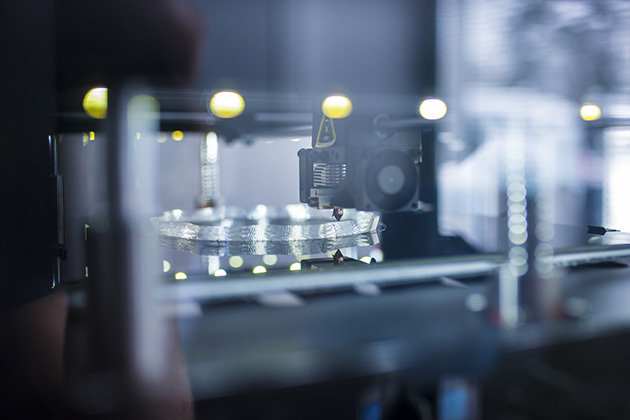 Leverage design for additive manufacturing (DFAM) principles for a seamless transition from rapid prototyping to rapid production. Lightweighting products using AM advances material usage and performance — and opens up opportunity to capture savings throughout the product’s lifecycle. AM has enabled the weight reduction of aerospace parts by as much as 70 percent, saving about $3,000 per year in fuel. Consumer demand for customization is rising, with 30 percent of Americans interested in product personalization. And additive manufacturing uniquely allows product designers to meet this demand with lower customization costs and lead times than legacy production methods. Once the base component of your product has been validated with AM, personalizing the product with a corporate logo or different texture is a simple change in the CAD file — with no custom tooling required. Allowing consumers to tailor a product to their design preferences or needs not only helps you stand out among the competition, but it also ultimately provides more value to the customer. Virtually any shape, feature or function can be produced using AM. And product designers can experiment with vastly different geometries and textures with each design iteration without incurring retooling costs — which can range from $25,000 to $100,000. It’s estimated that companies leveraging on-demand additive manufacturing can achieve total supply chain savings as high as 50 to 90 percent; especially for companies selling large quantities of replacement parts, on-demand additive manufacturing opens up opportunities to eliminate warehousing costs and reduce the risk of part obsolescence. AM allows design teams to refine and optimize their product with each design iteration. And because you’re prototyping on the same machine your product will be produced on, you can begin to validate the manufacturing process and your product’s performance during the prototype stage. In some instances, the time it takes to go from initial product concept to final product design can be reduced by up to 90 percent. There are many benefits to making the switch to AM, but of course there are challenges to consider. Producing a part through AM may mean you’re paying a higher per-part cost than conventional manufacturing. However, those fees can be offset because AM also virtually eliminates the need for warehousing, which is critical because housing inventory can add anywhere from 20 to 25 percent to overall costs of production. While it’s possible to use additive manufacturing to replicate an existing part that’s produced using traditional methods, it isn’t the best use of AM. To maximize a part’s performance, cost savings and material usage, it’s best to design it from the ground up with the unique opportunities and constraints of additive in mind. Or, in other words, you should create your product using design for additive manufacturing (DFAM) principles. DFAM draws on the same idea as design for manufacturability (DFM) — integrating process planning and product development. But instead of optimizing a product for urethane casting or injection molding, DFAM optimizes a product for production-grade manufacturing with additive technologies by analyzing competing factors to develop the most efficient design. Additive manufacturing isn’t as simple as hitting print, especially when using DFAM principles to design a part for industrial-grade quality while minimizing production costs. But the resulting parts meet the performance of traditionally manufactured parts while reducing lead times, eliminating tooling costs and maximizing design flexibility. Leveraging DFAM guidelines early on in the product development process allows product design teams to optimize their designs to capture the value of AM. Each successive slice of your part as it is printing (e.g., in FDM, DMLS, etc.) relies on the layers below it for support. Large overhangs, openings and other features may require additional support during the build to prevent warping and ensure the product achieves its performance tolerances. Parts designed with DFAM principles in mind will be self-supporting, minimizing the need for supporting features which can add cost through material waste and added post-processing needs. And if supports are required, one cost-saving consideration would be to orient the part so that supports are placed in regions that aren’t user-facing, where marks are acceptable. This reduces the sanding and finishing time required in post-processing. While additive manufactured parts can be built in many orientations, the angle at which a feature is built can affect its tolerances. And because features can only deviate from the spec so much until it affects tolerance limits, it’s important to consider a range of possible orientations early on in the design process. That way, you can identify which orientation is best-suited for producing your part. Consider a T-shaped part. When oriented right-side-up, tall supports are required to prop up the overhangs on both side of the part. Simply flipping the part upside down reduces the need for supports, and ultimately drives production efficiency by reducing surface finishing needs. Learn more about part orientation best practices here. It’s difficult to produce complex shapes with traditional manufacturing, which can necessitate creating some products as multi-part assemblies. If you are transitioning your product from traditional to additive manufacturing, it can often be consolidated into fewer parts to significantly reduce assembly costs. When Steelcase designed an arm cap using for additive manufacturing, for example, we transformed a three-part assembly into one uninterrupted partwith multiple functional zones. The unique geometries possible through additive processes allows product designers to leverage generative design tools (e.g., topology optimization or lattice structures) to optimize the structure of your part based on hundreds of variables. And because lattices allow you to precisely tune the strength and material density in different regions of a part, one contiguous part can meet different performance requirements in different regions. In the DFAM model, manufacturing is not the gating phase for part creation. Complex geometries, reduced material usage, on-demand customization and finely-tuned performance attributes are just the beginning of what’s possible. None of these guidelines address one of the biggest obstacles to transitioning to production-grade AM: An AM product design skills gap. Because of this gap, the most important design guideline is to align yourself with AM product design experts at the outset of any DFAM project. They will recommend design modifications that will optimize the cost and performance of your product. And they’ll understand how to drive efficiencies at the supply chain level through on-demand production and virtual warehousing. The sooner you involve expert AM design and engineering support, the greater the benefits you stand to earn with your switch to additive. Charlie Wood is the Manager of Computational Engineering at Fast Radius, a leading provider of on-demand additive manufacturing technology solutions — from entirely new products enabled by additive manufacturing to global supply chain solutions leveraging a virtual warehouse.